The Firewall component of Comodo Internet Security (hereafter known simply as Comodo Firewall) offers the highest levels of security against inbound and outbound threats, stealths your computer's ports against hackers and blocks malicious software from transmitting your confidential data over the Internet. 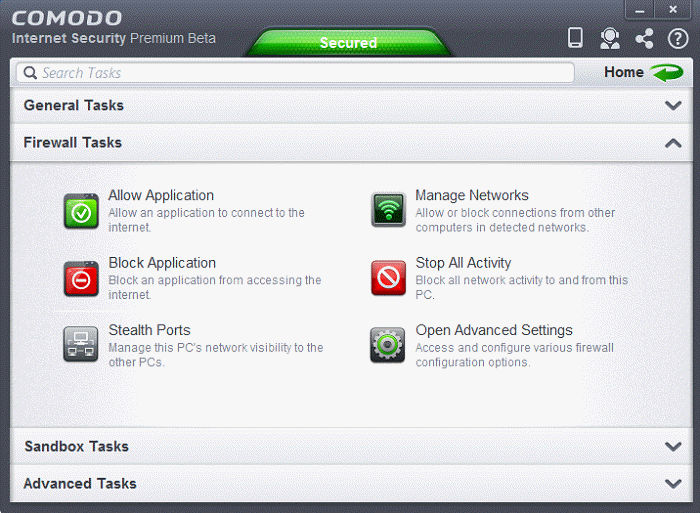 Comodo Firewall makes it easy for you to specify exactly which applications are allowed to connect to the Internet and immediately warns you when there is suspicious activity. It can be accessed at all times by clicking on the 'Firewall Tasks' band from the 'Tasks' interface. The Firewall Tasks area provides easy access to all major features and settings. From here, you can configure Internet access rights per-application, stealth your computer ports, manage available networks and even block all network traffic in and out of your computer. In ‘Advanced Settings’ you’ll be able to specify overall firewall behavior and configure advanced settings such as application rules, rulesets, network zones and port sets.